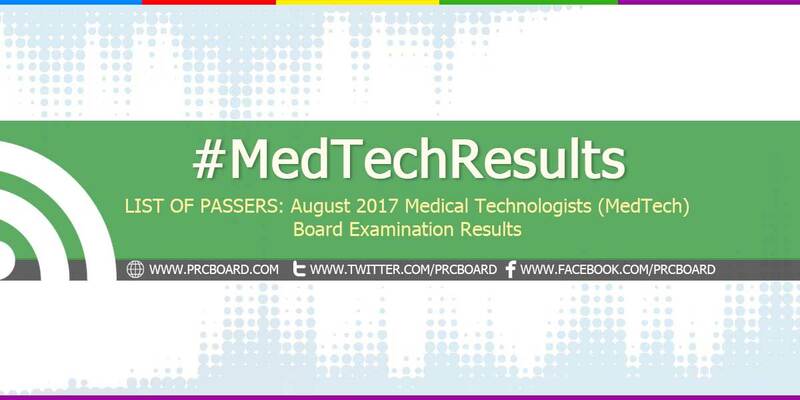 MANILA, Philippines – The 'August 2017 Medical Technologist (MedTech) board exam results' together with the list of passers, top 10 examinees, top performing schools and related announcements are available at this website as PRC officially released the results online three (3) working days after the last day of board examination. As announced, 4,821 out of 5,661 examinees passed the exams. The licensure examinations are administered by PRC Board of Medical Technology headed by its Chairman, Dr. Marietta C. Baccay and its members, Ms. Marilyn R. Atienza and Ms. Marian M. Tantingco on August 26-27, 2017 at PRC testing centers in Manila, Baguio, Cebu, Davao, Iloilo, Legazpi, Lucena and Tuguegarao. These important registration schedule and requirements shall be secured by a successful examinee. The schedule of online appointment for issuance of Professional ID and Certificate of Registration will be from September 6-13, 2017. Registration requirements: duly accomplished Oath Form, Notice of Admission (NOA), two (2) pieces of colored passport ID picture with white background and nametag and two (2) sets of doc stamps. PRC is strictly implementing the online registration system for processing of appointment for registration effective March 30, 2016, details of which are written here. According to the Commission’s Resolution No. 2016-1019 series of 2016 entitled “Schedule of Licensure Examination for Year 2017”, the target release date of August 2017 MedTech result will be in three (3) working days after the last day of board examinations or by August 31, 2017 (Thursday). However, results may also be released earlier or later without prior notice. On the same exams conducted by PRC on February 2017, August 2016 and March 2016, results were released after three (3) working days. The two days MedTech board exams covered topics from Clinical Chemistry, Microbiology and Parasitology, Clinical Microscopy, Hematology, Blood Banking and Serology and Hispathologic Techniques, Cytotechnology, Medical Technology Laws, Related Laws and its Implementing Rules and Code of Ethics. Medical Technology is one of the programs with average number of examinees being administered by PRC. During MedTech exams conducted February 2017, 2,378 out of 3,216 examinees passed. Saint Louis University, Adventist University of the Philippines and Far Eastern University - Nicanor Reyes Medical Foundation shared the top spot in the top performing schools' list garnering 100% passing rate. Vanessa Leslie Rivera from Far Eastern University - Manila ranked first in the exams having 91.20% followed by David Marco Abaya Bildan from Saint Louis University having 90.60%. On August 2016 MedTech exams, 4,144 out of 5,126 examinees passed. Cagayan State University - Andrews Campus, Cebu Doctor's University and Saint Louis University are the top performing universities having 100% overall passing rate. Meanwhile, Roselle Louise Luga Publico and Clarisse Joan Ceriales Cadano from Silliman University got the first two spots having 91.10% and 90.70% rating respectively. Meanwhile, below is the table showing the number of examinees, total number of passers and overall passing rate in the last four (4) exams, courtesy of PRC. To receive up-to-date news about MedTech results for August 2017, we advise our visitors to bookmark this page, visit PRC official website or follow us at our social media pages via Facebook and Twitter. Good luck to all MedTech examinees! Keep the faith! oo nga napaka thrilling naman bakit hanggang ngayong oras na ito wala pa ring result kailan pa kaya tayo maghihintay? Faith faith faith!!!!! Sana 7 pm hahahahahhahah please!!!!!!! when is the result coming out? What time will the result come out? i thought august 31 is the releasing date. Results are expected to be released today as per Commission's Resolution... Good luck everyone! Goodluck to everyone!! Keep believing in yourselves !! Have faith and don't give up! hi admin we are w8ting for medtech board exam result prin po.wat tym po kya? Anong oras po maglabas ang result? What time will you release the result? Patiently waiting for the result. Gudluck to everyone... sana madami makapasa? What tyn daw release ng result? what time out ng result? Lord Jesus, we praise and glorify your name. You are the Lord of lords, and the King of kings. We believe that you had done it on the cross.We entrust to you the result of this med. Tech. Board exam. This we ask, in Jesus name. Amen. What time po ngayong araw malalaman ang result? What time po ba ma release ang result ng MTLE? Ang tagal. Today is the last working day of the week. Holiday po bukas FYI. Dont tell us na Monday pa release. Wala namang nagbibilang kung ilang beses akong nagreload sa page na ito diba? Konting patience lng po. Last year 7 pm na na release yung results namin. Most probably mga around 6 pm or later than 6 pm. patawad kung naghintay ka.. pero Monday pa po talaga ang releasing ng list of passers. still waiting..have faith..and claim it..100% fullfil..pasado lahat.. In Jesus Name..Amen..
relax lang kayu,,,6:30-7 pm ,,mayron na. Chill guys, nenerbyos din kame. God ikaw na bahala. I give it all to you. Meron n po b result? Bakit po ang tagal. Huhuhuhu. please help all of the aspiring rmts pass! those who deserve to pass! Congrats po sa mga pumasa! Congrats sa anak ko woohoo!! pasado!! To Our Almighty God! Thank you so much! Thanx also to PRCBoard.com. GOD BLESS!